Coach Blake is the Head Coach for the Schofield Sharks. He is an American Swimming Coaches Association Level 2 certified coach, with Level 3 education credits. He has been coaching the Sharks since April, 2001. Prior to that, Coach Blake had been the Head Coach of the Foster Village Torpedoes from 1976 to 1978, then he became the Primary Assistant Coach for the Aloha Aquatics team in Mililani from 1981 to 2001. 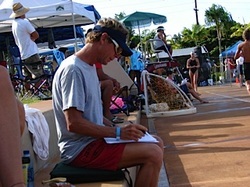 During his time at Aloha Aquatics, Blake also served as a Water Safety Instructor for the Mililani Town Association's Aquatics Program, by providing the instruction needed for swimmers in swim lessons to transition to age group swim team, high school swim team, and even some college bound swimmers. Throughout his time as a coach, Blake also worked with the City & County of Honolulu Emergency Services Division as a Paramedic (34-years and 7-months total). He retired from that position in 2009. Coach Blake still enjoys an active lifestyle by continuing with his own swimming (including Open Water races), biking and triathlon racing. Fun fact: Coach Blake was a Schofield Shark swimmer, along with his sister and brother, from 1967-1969!